Course Description: Here is an detailed dive into the C language. This course runs cyclically, uncovering topics one at a time while reinforcing concepts already learned and presented. It moves at a quicker pace than my Learning C title (below), designed for C coders eager to get started and absorb as much of the language as possible. Course Description: Get a quick introduction to the vocabulary and basics of programming in C, the language that inspired C++, Python, and many others. Covers flow control, variables, and other "getting started" topics, but also introduces advanced concepts such as pointers and memory allocation. Challenge movies allow you to test your learning along the way. Course Description: Code Clinic is a series of programming courses where authors solve the same problems using different coding languages. Here, challenges and solutions are presented in the C language. These challenges include topics such as statistical analysis, geolocation, and accessing peripheral devices. Course Description: Once you've mastered the basics of programming in C, you can concentrate on writing more efficient, more functional code. 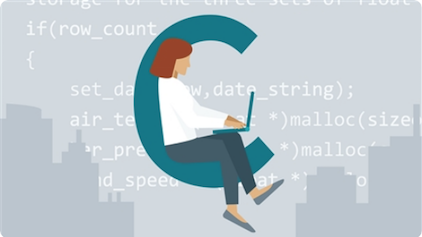 This course offers some tips to help you extend your C programming skills. Learn how to read and write main function arguments, build more useful variables, and work with arrays and structures. Plus, get tips on generating pointers, and take the practice challenges to test your skills. See other great courses and get more information from LinkedIn Learning.